we Territorians understand that a minimalist model – removing references to “race”, tinkering with the race power and inserting some symbolic words – would be pointless. Without a substantive constitutional guarantee like a racial non-discrimination clause or a constitutionally mandated First Peoples body, it’s just pretend change. Christine Judith Nicholls’ long essay in Guardian Australia on the Indigenous instrument, the yidaki of the Yolngu people of northeast Arnhem Land. Embedded in a complex web of interconnected relationships, the yidaki is part of an extended network comprising the humans and Spirit Beings belonging to Yolngu country, its sacred topography and environment, the Yolngu kinship system and the Yolngu Matha language. The yidaki is thus connected to Yolngu Law and ceremony – song, dance, visual art and narrative. The yidaki features in a major exhibition at the South Australian Museum. See also Paul Daley’s article posted 20 March (below). More from Paul Daley in Guardian Australia on the saga of Narcha (Barry Clarke), father or uncle of Indigenous serviceman, Douglas Grant. A current Australian War Memorial exhibition on Indigenous service is reviewed here. Paul Daley writes in Guardian Australia about a yidaki (didgeridoo) event in Adelaide. ‘Together with the clapsticks and the Indigenous voice in traditional song, [the yidaki’s] it’s a haunting, distinctive, meditative sound that has not only come to characterise Australia’s Indigenous people but perhaps the continent itself.’ Dominic O’Sullivan asks in The Conversation whether having designated Indigenous seats in our parliaments could help reduce inequality. we have to start by addressing the underlying issue of trauma. Colonisation has caused enormous distress for our communities. 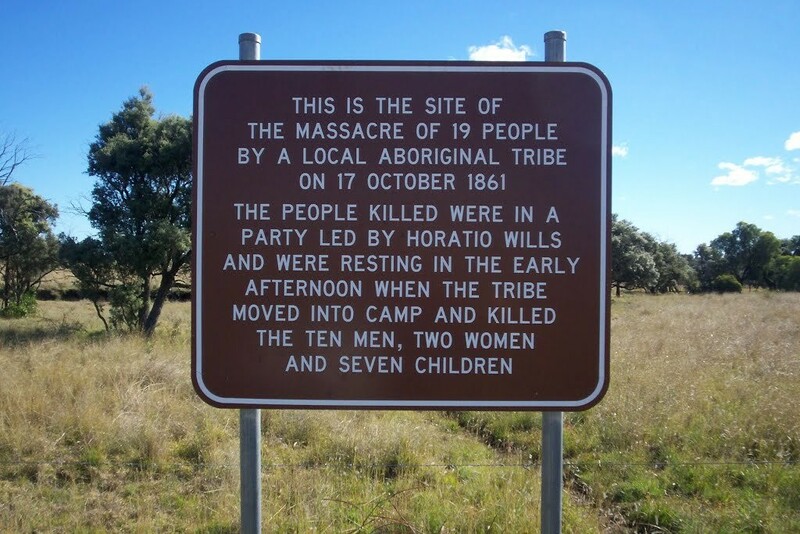 The forcible removal of children from their families; the taking of land; the devaluing of Aboriginal and Torres Strait Islander cultures; subjecting our people to poor education and substandard housing on reserves; and the ongoing generational impact of this has created waves of trauma throughout our history. Paul Daley in Guardian Australia on the need to revisit the way we honour John Batman, Lachlan Macquarie, and Angus McMillan, some of the colonial leaders we eulogise and commemorate despite their being deeply unworthy because of their actions towards Indigenous Australians. University of Adelaide research on Indigenous DNA takes the Australian Indigenous story back 50,000 years with implications for connection to country. Paul Daley writes in Guardian Australia about the work of the South Australian Museum on connecting Indigenous Australians with the artefacts taken from them by collectors. Karina Marlow and Luke Pearson on NITV about Pemulwuy, Windradyne, Yagan and others who fought for Country. For more, see the chapters by Larissa Behrendt and Paul Daley in The Honest History Book (coming in April). Calla Wahlquist in Guardian Australia canvasses a range of opinions on ways of bringing down the rate of Indigenous incarceration. Incarceration is ‘colonisation’s cruel third act; both a product and cause of ongoing intergenerational disadvantage’. More than 400 comments. The prime minister’s speech referring to the full report. Bill Shorten’s response. Michelle Grattan. Guardian Australia report. ABC report. A comment from Amy McQuire, one from Paul Daley, and one from Melbourne University academics. Wakka Wakka woman, Colleen Lavelle, who has an inoperable brain tumour, says in Guardian Australia, ‘the medical profession is full of bigots and people who might not consider themselves racist, but have preconceived ideas on race and hold outdated beliefs in racial stereotypes. In The Conversation, Maryrose Casey writes about a new wave of Indigenous playwrights – ‘joyous, comic and grim’. Monica Tan in Guardian Australia makes some points which resonate with contributions to The Honest History Book, coming soon. We are Australians yet strangers in a foreign land [says Tan] – a nation in limbo yet to reconcile with our own history. To reconcile with history is to begin to reconcile with Indigenous Australia; to reconcile with Indigenous Australia is to begin to reconcile with the land. Then, and only then, might we truly know how to proudly and unequivocally call this place home. Talking of pictures, here is one posted by Ben Wilkie on Twitter. It ‘commemorates’ the Cullin-la-ringo incident in Queensland in 1861. What is missing from the wording on the sign? A contemporary newspaper account might help. More from the Queensland Historical Atlas. A collection from Guardian Australia. Paul Daley in Guardian Australia on the inclusion of Warlpiri drawings in a UNESCO collection. Westaway, Olley and Grun write in The Conversation about the evidence that Australian megafauna lived alongside Indigenous Australians for thousands of years. The authors examine various hypotheses for co-existence, focusing on the Willandra Lakes area of New South Wales. Calla Wahlquist writes in Guardian Australia about Gunditjmara efforts to get world heritage status for 6000 year-old eel traps in Lake Condah. According to Monash University professor, Ian McNiven, the Lake Condah evidence ‘allows a new conception of Aboriginal people as active environmental manipulators and managers for thousands of years’. There is more on this history in Bruce Pascoe’s book Dark Emu.